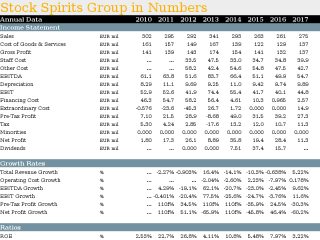 This Annual Statistical Dossier offers a summary of Stock Spirits Group's performance between 2010 and 2017 on an annual basis. The report can be downloaded as an Excel file. This Annual Statistical Dossier offers a comparison of 12 banks from PX Index from 1900 to 2017 on an annual basis. The report can be downloaded as an Excel file. You will find here the key numbers from the banks' balance sheets such as loan and deposit breakdown, or capitalization, income statements for the sector and the main ratios related to the banking business such as asset quality, number and cost of employees or details on banking infrastructure. If you are only interested in particular areas of a bank's business, you can find and download specific indicators from the bank's Corporate Profile, or specific charts from the bank's Chart Section, where you can find a comparison of the bank with its peers. If you are interested in the banking quarterly figures, please refer to the banking Quarterly Statistical Dossier. Who Was the Most Profitable Among PX Index in 2017? Based on a comparison of 12 firms among PX Index, Erste Group Bank generated the highest net profit in 2017 followed by CEZ and Komercni Banka. 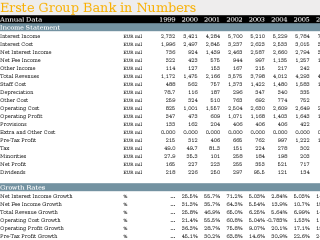 Erste Group Bank made a net profit of CZK 34,673 mil, up 1.41% compared to the previous year. Historically, the firm’s net profit reached an all time high of CZK 34,673 mil in 2017 and an all time low of CZK -38,077 mil in 2014. The average profit in the last five years amounted to CZK 11,753 mil. The company generated an average return on equity of 2.60% for its shareholders in the last five years with a maximum of 8.05% and a minimum of -9.82%. Comparing Erste Group Bank with its closest peers, CEZ generated a net profit of CZK 18,765 mil with a ROE of 7.28% in 2017, Komercni Banka netted CZK 14,930 mil (ROE of 14.5%) and Vienna Insurance Group announced a net profit of CZK 7,839 mil giving a ROE of 6.33%. You can see all the companies net profit data on the Net Profit indicator page or you can download a special statistical dossier on the PX Index in the reports section. Who Created the Largest EBITDA Among PX Index in 2017? Based on a comparison of 8 firms among PX Index, CEZ generated the highest earnings before interest cost, taxes and depreciation (so called EBITDA) in 2017 followed by O2 Czech Republic and AVAST Software. CEZ made EBITDA of CZK 54,925 mil, down 0.303% compared to the previous year. Historically, the firm’s EBITDA reached an all time high of CZK 95,511 mil in 2010 and an all time low of CZK 19,011 mil in 1999. The average profit in the last five years amounted to CZK 61,168 mil. The company generated an average EBITDA margin of 29.6% for its shareholders in the last five years with a maximum of 33.9% and a minimum of 27.0%. Comparing CEZ with its closest peers, O2 Czech Republic generated EBITDA of CZK 10,506 mil with a EBITDA margin of 27.8% in 2017, AVAST Software grossed CZK 6,363 mil (EBITDA margin of 41.7%) and Philip Morris Czech Republic announced a profit of CZK 4,936 mil translating into a margin of 40.5%. You can see all the companies ebitda data on the EBITDA indicator page or you can download a special statistical dossier on the PX Index in the reports section. Who Created the Highest Margins Among PX Index in 2017? Based on a comparison of 8 firms among PX Index, AVAST Software generated the highest EBIIDA Margin in 2017 followed by Philip Morris Czech Republic and Central European Media Enterprises. Comparing AVAST Software with its closest peers, Philip Morris Czech Republic generated EBITDA of CZK 4,936 mil with a EBITDA margin of 40.5% in 2017, Central European Media Enterprises grossed CZK 3,870 mil (EBITDA margin of 28.8%) and O2 Czech Republic announced a profit of CZK 10,506 mil translating into a margin of 27.8%. You can see all the companies ebitda margin data on the EBITDA Margin indicator page or you can download a special statistical dossier on the PX Index in the reports section. Who Was the Largest by Sales Among PX Index in 2017? Based on a comparison of 8 firms among PX Index, CEZ generated the highest sales in 2017 followed by O2 Czech Republic and AVAST Software. CEZ made total sales of CZK 201,906 mil, down 0.902% compared to the previous year. Historically, the firm’s revenues an all time high of CZK 216,988 mil in 2013 and an all time low of CZK 48,816 mil in 1994. The average sales growth in the last five years amounted to -1.26%. Comparing CEZ with its closest peers, O2 Czech Republic generated a sales of CZK 37,786 mil average sales growth -5.65% in 2017, AVAST Software sold products and services worth CZK 15,262 mil (5-year growth of 48.9%) and Central European Media Enterprises announced revenues of CZK 13,423 mil translating into average nominal growth of 48.9% in the last five years. You can see all the companies sales data on the Sales indicator page or you can download a special statistical dossier on the PX Index in the reports section.